Cherringham is an ongoing “cosy crime” eBook series, that launched in December 2013 and features unlikely sleuthing duo Sarah and Jack. Released in monthly episodes, it is written by award-winning game and TV writers UK-based Neil Richards and US-based Matthew Costello in a transatlantic collaboration – which mirrors that of Jack and Sarah. The new series, released from March, launches with A Lesson in Murder, in which the two are asked to investigate the violent death of a popular teacher at Cherringham Girls School. 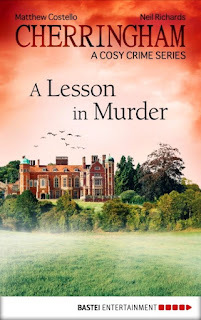 I’ve always quite enjoyed the occasional cozy crime story and was intrigued when asked to review a couple of Cherringham episodes. I hadn’t heard of this series before and the ones I’ve read were numbers 14 and 23 in the series. I was sold on the description of the series being a mixture of Miss Marple and Midsomer Murders, and I would say that it is quite accurate. When talented young artist Josh Andrews goes missing after a stag night prank at Cherringham Golf Club, the bride in desperation asks Jack and Sarah to find him. It seems he’s gotten cold feet, with the wedding just days away. 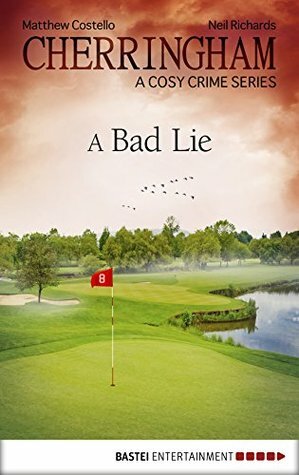 But Josh is not all he appears to be … And soon suspicion falls on the Golf Club itself. Can Josh be found before he takes justice into his own hands? This series is ideal if you want a quick and easy read, I read each in one in about a hour or so. I was late coming to this so have missed the backstory to Jack and Sarah, although I didn’t feel disadvantaged and a potted history of both characters is given at the beginning of each book. In The Secret of Combe Castle, Oswald Fitzhenry and his wife Edwina are struggling to maintain the castle and estate. Edwina wants to sell but Oswald won’t hear of it, the castle has been in his family for generations and even though the roof is leaking, there are puddles everywhere and the electrics are dodgy, he won’t be moved. But someone is sending poisonous notes and events escalate to breaking in and damage being caused. Oswald’s pride and joy is his Odditorium – the warren of chambers devoted to the castle’s long history of incarceration, torture and execution. To be honest, the display sounded more like a poor man’s Madame Tassaud’s but even so it’s not somewhere that I would want to be at night! Jack and Sarah are asked to investigate and discover who is sending the notes. The Fitzhenry’s are not the most popular couple in the village and there is no shortage of suspects. 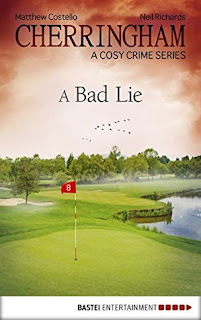 In A Bad Lie, a groom is the subject of a practical joke on his stag night and goes missing just before his wedding day and Jack and Sarah are asked to find him. However things are not as they seem and both Jack and Sarah are in for a surprise as they try to uncover the mystery. The sleuthing duo are the most unlikeliest of pairings – Jack, a widower and a brash ex NYPD cop living on a canal boat and Sarah a web designer and single mother but they both seem to enjoy the excitement and possible danger of their investigations and they work well together, I get the impression that romance might be on the cards? 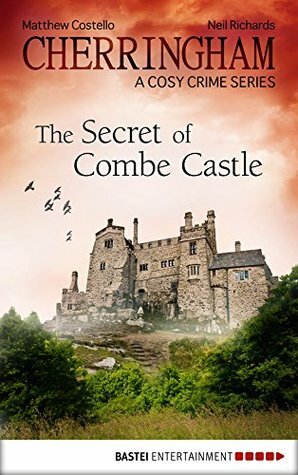 The mysteries are intriguing and well written and although I wouldn’t go back and read the entire series, I would dip into one now and again. Both of the stories I read had one or two twists in them to make them interesting and to keep you on your toes. Co-authors Neil Richards (based in the UK) and Matthew Costello (based in the US), have been writing together since the mid 90’s, creating content and working on projects for the BBC, Disney Channel, Sony, ABC, Eidos, Nintendo to name but a few. Their transatlantic collaboration has underpinned scores of TV drama scripts, computer games, radio shows, and – most recently – the successful crime fiction series Cherringham. Now into its second season of 12 novellas, Cherringham is popular around the world, having sold over 65,000 copies and has been adapted as a series of audiobooks in Germany. My thanks to Sophie at ed Public Relations for the two Kindle files to read and review.